Waikoloa Beach Villa in Hawaii with 2 Bedrooms, Swimming Pools, Hot Tub, Fitness Room, Close to Beaches & More! 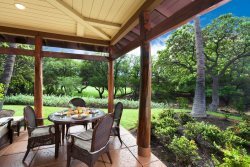 Waikoloa Beach Villas is a fun vacation home located in Waikoloa Beach Resort and is the perfect getaway for two couples or a small family. Every guest can sit back and enjoy their time together in this magnificent Villa with features such as; 1,209 square feet of luxurious living space, two bedrooms, two full bathrooms, and sleeps up four guests. Superior quality throughout enhances the vast living spaces, and the furnishings within the property are to a very high standard and modern in design. The living room is the focal point of this beautiful villa and features a large flat screen TV and comfortable furniture. The gourmet kitchen is impressively equipped with top-of-the-line appliances and plenty of workstations for food preparation. The dining area seats six with additional seating for four more at the breakfast bench. Just off the living room is a covered lanai with a dining table that seats four. The master suite features a cozy king-size bed, flat screen TV, a walk-in shower and a separate deep-soaking bathtub. The guest bedroom features two twin-size beds, a flat screen TV and is very close to the main bathroom. Also included; air conditioning, basic cookware, rice cooker, dishware, drinkware, coffee maker, blender, washer/dryer, hairdryer, bed and bath linens, beach towels, iron, air-conditioning, high speed WIFI, basic cable TV with HBO and Showtime. Enjoy an unbeatable awe-inspiring view of the beautiful gardens and manicured lawns with a two swimming pools and two hot tubs while relaxing and reconnecting with family and friends. There is also a fitness center with top-of-the-line fitness equipment. All units have informative guidebooks to help you get the most out of your stay. The Beach Villas are located close to the Queen’s Shops, a quaint shopping destination complete with art galleries, a gourmet grocery store, clothing boutiques and some of the best dining available such as Sansei’s Steak and Seafood, Aloha Bar and more. They also have a convenient food court with “upscale fast food” such as Lemon Grass. The “King Shops” are also conveniently located, with exclusive high-end retail stores and restaurants. We take pride in our meticulous standards of cleanliness and pleasure in providing outstanding customer service. Here at ResorticaHawaii.com we truly “Live Aloha,” and hope to share it by welcoming you and yours to paradise. Our rental car wouldn't start one morning and we went and found a staff member from management who graciously helped us get the car started so we could drive it back to the rental facility. We can't wait to book our next stay in unit I2. It has everything you need to make your vacation complete.